No love for the large 25? Discussion in 'Chris Reeve Knives' started by Dogdrawz, Nov 5, 2018. It's still a CRK and almost an Inkosi . tuica and BellaBlades like this. I've received my 25 & I like it! Dang it, now I really need to purchase another Inkosi to compare. Thanks to all for your responses! Ajack60, BellaBlades and tuica like this. I prefer the 25 to the Inkosi. I like the stop pin arrangement better with it being locked in with a screw on each side as opposed to floating. I prefer as many points of attachment of the scales as I can get and the 25 has 2 instead of the inkosi's 1. I also may be in the minority here but the clip on my 25 has never bothered me or created any hot spots. In fact it sits in my pocket better and closer to the pocket seam which creates more room for my mitts when I am playing pocket pool. LOL I also like how it applies a little lockbar tension as it prefer to set my opening and closing to a smoother more hydraulic feel then drop shut. I don't agree with most that it is harder to disassemble then the inkosi. I found the technique of rotating the scale off from the back to be the easiest way to disassemble/reassemble. To me the 25 is exactly what I always wanted in the 21 (larger pivot, finger scallops, ceramic ball lock face/detent, no manufacturing hole). I guess it is just preference. I am a fan of the 25 as well. If I am not carrying a large 21 insingo, the 25 is with me. Well it's time for blade replacement. Off to CRK. Hello $167.50 bill. Time to sell more knives! There's still plenty of life left in that blade. Why not use it as is for a bit and at least get some use out of it before sinking more money into it ? You are completely right. Take that $$$ & start looking for another CRK! So it is written & so shall it be done! I like the 25 but I like the improvements made to the Inkosi more. Combine that with the fact they are no longer making parts for the 25 I just can't see a reason to buy one unless: you got a great deal, you want one for the collection, you want a specific version (like flag or damascus), you hate the Inkosi pocket clip, you prefer the shape of the Inlays, or you are a contrarian by nature. Otherwise I'd just get the Inkosi since I know they will have parts and blades available for quite a while. I love the 25-- it was my first Chris Reeve (the original plain Jane). I still prefer it over the Inkosi for the grind profile, frame shape, and two frame screws (as opposed to the floating front pin). Sold off a few but still have these in my CRK collection. tuica, ZT0620OWNER, Dogdrawz and 1 other person like this. Fantastic lineup. Makes me wanta a micarta 25. How on earth can you pick just one to carry with a collection like that?! It's actually fairly easy- I don't carry them . The only exception was the micarta inlay which I carried on weekends a few times. In the end I found the small Sebenza 21 the perfect size and in particular two favorites are a Tanto with dual silver thumb lugs and a basket weave Damascus CGG. I need to add that nothing fits better in my hand than that Sebenza 25 with micarta inlay. That includes Sebenza 21's, Inkosi's, Umnumzaan's, and even a Ti-Lock. Maybe because it's getting close to the size of a fixed blade handle with the inlays. One good reason to do it now is you don't know when they will run out of blades for sale if they have any at all. They might be saving what they have for warranty. I would at least check in with CRK on stock levels. 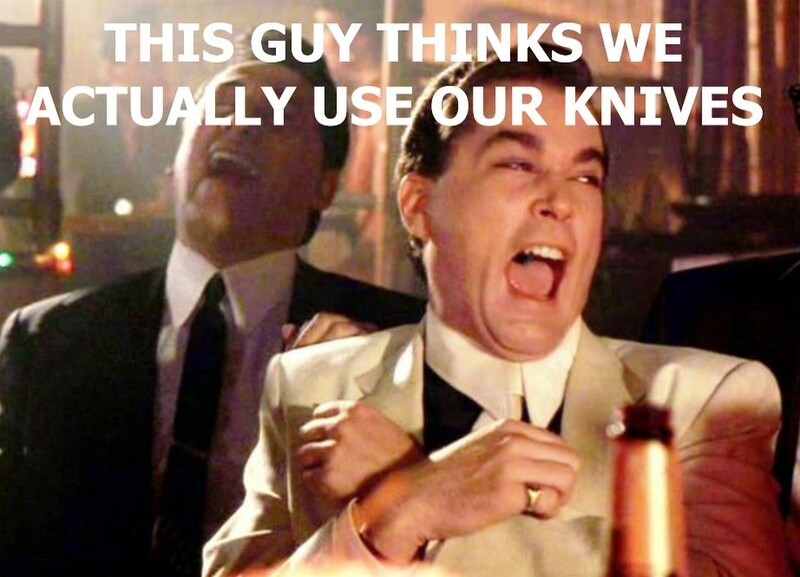 And of course figure out if you like the knife first. I was thinking that very thing & I did contact em. CRK said they can do it. Buuuuuut....I found an Inkosi & the 25 has to go. If I could afford to keep both I would. Great knife. The 25 is my only CR. I think the asymmetric stop pin/spacer is poorly designed. It gave me problems because it can jam the blade if it rotates. I understand Mr. Reeve had left the company prior to this model. Chris was still with the company when the 25 came out. The first batch of 25's have a pinned stop pin. the spacer is stationary. CRK then changed to the removable stop pin sometime in 2013. From pics I've seen, I'd guess March/April timeframe. BBuser and Wavicle like this. A couple of drops of blue Loctite and the rotating stop pin is a non issue. While I do like the Inkosi I prefer the face side of the knife to have more than one rigid point of attachment. The 25 gives me that. I am not a fan of floating stop pins.